The way I look at it, I was destined to love film. My father set me up to love stories (every night he’d tell me one – two if I hadn’t been wicked) and I was a voracious reader, saving my childhood pennies not for toys but for school book drives. With no TV at home, the first time I ever saw a moving, real action story come to life on the big screen made a definite and long lasting impact. When I was seven, my half-sister, who was nine years older than I, came to live with me in our little town for the summer. The only place happening at that time was a small movie theatre that had two screens and showed four matinees each weekend. She took a job there and snuck me in each weekend where she’d get me a popcorn, a soda and then sit me in the theatre and tell me not to move. And for the next four to five hours I wouldn’t. I can’t remember being more content whilst watching every movie that came to town – often three or four times. Some kids looked forward to the weekend for playing, I looked forward to see Pippi, Popeye, The Muppets. When my sister left my house, the theatre visits died down as there just wasn’t the money to go every weekend. However, my parents, who were also film lovers in a quiet way (they would rattle on about every big star from the 30’s, the 40’s, the 50’s – they loved the glamour, the sweethearts, the men!) came up with the idea of movie date nights twice a month. We’d all doll up in our finest and go to an evening (!) show. We stood in line for ET, we cheered in Star Wars and we tapped our feet in Annie. And it wasn’t always children’s movies we’d see – they took me to see the violence of Platoon and the romance of Out of Africa. There wasn’t anything I wasn’t allowed to be exposed to. No big deal was ever made about what was appropriate. What was made a big deal was the discussion afterwards about what we thought and our points of view. It was my father who introduced me to my all-time favourite movie, Lawrence of Arabia. We were out on a lake when he began to tell me the history of how it was made; the length of time, the struggles it took, the actors involved, the drama of the scenery. He had seen it when it premiered in a theatre and had never forgotten that experience. I hadn’t ever thought of the ‘how‘ of movie making before – the people, the production, the time and effort – and was taken to a whole new level. I was 18 before I saw that movie on a little black and white TV and vowed that one day, I’d see it in colour. I wanted that experience my father still gushed about 30 years later. I started reading so much about film history, the behind the scenes, the craft, the legends. When I was in my early twenty’s, living in Vancouver, Canada, I made my first debut into working in film. It was easy, then, to get in. The city was relatively small, there were lots of movies being made, and I knew a lot of actors from hanging out (obsessively!) in Theatre Sports. I took jobs via word of mouth – everything from stand in’s to a PA to being an extra. Any job that I could get, I’d do – even if it was a friend just asking me to tag along and help out without pay. It was always a yes from me. In 2004 I got a call from Paramount and visited the studio to meet for a project. Getting a personal tour of all the movie history had me giddy and hooked so I moved to Los Angeles. I was fortunate that I had great work and mentors right away and that I easily connected to people I needed to in the industry. But it was a huge eye opener for me – to go from small town movie making to the big league. It was a whole new level. I found myself falling deeper in-love with film thanks to the people I was meeting and places like the Areo Theatre which played classic movies as they should be seen. I finally saw Lawrence of Arabia on the big screen – three times! And then my second favourite film – Singing in the Rain – also ran and seeing that in the theatre, with people, my people who loved and got film on the same level, solidified my passion and love for movies – in wanting to be a part of something that could change and affect people the way that those movie experiences had me. But at the same time, the deeper in I went, the more I found myself totally falling out of love with Hollywood. Maybe it was the times or seeing the man behind the curtain, but the glamour I had always envisioned didn’t exist anymore. The family feeling of being on set that I had experienced so often elsewhere was replaced by a lot of competitive insecurity. I saw more and more films of meaning being pushed aside in favour of movies that I couldn’t stomach to watch, let alone help make (I think I was one of the few people who turned down so much work. I sometimes regret having to believe in what I do). While there are a lot of amazing, down to earth people in LA (even celebrities), the LA Hollywood scene was not a good fit for me. I loved going to premieres to see the movies and hear the directors talk to it but I hated the schmoozing and always felt awkward. I loved donning gowns for big events but since they were borrowed I always felt less than because I didn’t own one (or a mansion in the hills like most of my peers). When a famous director said to me I got a lot of work because I was one of the few people that didn’t talk in this town, instead of taking it as a compliment, I took it as a sign that sincerity, loyalty and discretion was a rare thing in this town and that made me nervous and truthfully, lonely. Like a lot of people who go into Hollywood with the best intentions, I ended up finding myself swept up and caged in by the bubble. I spent less time on the storytelling aspect of my life and more on the managing side. And I wanted out but wasn’t sure how – what else was there? When the writers strike happened in 2008, the town was devastated; studios closed, movies weren’t being made, people were out of work (and not just film people – the people they supported like local restaurants, house keepers, delivery drivers, cleaners, etc.). Living in LA during this time was really scary and depressing – everyone was affected. And then the recession hit and well, the glory days of film in every sense of the word seemed gone. It was actually heartbreaking for me to see what the industry had become and who I had become in it. I took this downtime to think about if I should keep pursuing film or if I should take a break. And when I saw an opportunity to leave LA for Philadelphia and do something un-Hollywood, I took it as that spark that I used to feel about film was totally gone. And the saying is, when you’re always angry or always tired in your job, it’s time to go. So I went. I confess that for the first little while, the fresh air did me some good. I liked not being a part of it all, of being relatively normal, of not being disappointed by what was at the box office. The quiet was goof for me to think about who I really was, what my creative purpose was, what really inspired me, the kind of people I wanted to be around. It was a great time for reflection – something I’m so thankful to have had. However, couple months in, I literally ran into a LA friend in Rittenhouse Square. He was here finishing up a big movie and started telling me about everything that was going on. And something happened – I got a little jealous! I missed the community of a movie set – where you’re working 18 hour crazy days but you’re all part of something amazing. I missed the juicy behind the scene details and getting my hands dirty for coordinating to set building. But, I thought, I’m not ready to go back in. The week after that my LA hairdresser was at her NY Salon and, in catching up, she told me she was transforming her book into a screen play. I had loved working in development so I got a little more jealous! The following week I went and saw a movie staring a friend of mine – it was the first movie I’d seen since leaving LA. I had met my friend in the Spring of 2007 when he’d first come to LA to do this movie and I remember the conversation we had about doing his first movie here and the excitement and the process. A year later I ran into him at his first premiere (for his second film) and talked about the crazy experience of that and the process and how he was part of film but not Hollywood. And watching that movie, and remembering those conversations, well, let’s just say I fell for film all over again. Instead of just remaining jealous at others leading a life that I felt I was missing out on (despite my own choosing to leave), I made a plan to reconnect. I qued up my Netflix in earnest and began to watch as many films as I could (which was easy during this long winter in a new city). From classics to recent releases to Oscar Nom’s, I realised that film is such an important medium – much more I think than TV – because it really has the ability to transport you for a solid 1.5-2hrs and change you. I studied film again, I connected with people in the industry who were bonafide and were into film for all the reasons I was. And I even took on a project from Philadelphia just so I could be part of the process again – just in a different way than before. Well, actually, the same reasons I initially was – a coming home project if you will. I have rated over 2,000 movies on Netflix and counting. While there are a lot of disappointments out there (and a lot of films I avoid), there’s so much good to see. So many movies that change change you and that doesn’t always mean in a dramatic, life-altering way. Sometimes it’s just in little shifts like making you feel good (Amelie), laugh (Waynes World), be charmed (Être et avoir) or want to dress up (The September Issue). Sometimes they just leave you in awe (Giant), help you understand differences (My Brother’s Keeper), give you permission to cry (Phoebe in Wonderland), see yourself (Before Sunset), remind to you pursue your dream (Walk the Line) even when you think it’s over (Shut Up and Sing) or completely impossible (The Diving Bell and the Butterfly). Movies can make you want to try something new (Whip It), question things (Henry Poole is Here), feel things (Into the Wild), think of things (The Prestige), have an adventure (The Goonies), want to be part of a family (The Family Stone), learn to be supportive of someone (Lars and the Real Girl), or fall in-love with them (The Notebook). They can also teach you about being in high school (Breakfast Club), teenage girls (Mean Girls), standing up for what’s right (To Kill A Mockingbird), being a publishing tycoon (Citizen Kane), finding yourself (Stand by Me), friendship (Fried Green Tomatoes), couture (Valentino), horse racing (Seabiscut), faith (The Song of Bernadette), war (Saving Private Ryan), the old west (Appaloosa), Vegas (Casino), history we should never forget (Schindlers List) the bad side of Hollywood (Sunset Boulevard) and the magical (Chaplin). A good movie will also introduce you true acting (Last King of Scotland), incredible cinematography (Gone With the Wind), visionary directors (Moulin Rouge), classic songs (The Sound of Music) and incredible steps (Singing In the Rain), talented set designers (Lord of the Rings), stylists (The Duchess) and the power of storytelling (Ghandi). So after a couple of years of not feeling it, I am totally embracing and supporting film at The Oscars and am beyond excited for tonight’s festivities and celebrations. I’m putting on a dress, I’m sipping champagne, I’m air kissing with gusto and just being proud to be part of an amazing industry. Because at the heart of it all, I’m a story teller and film is one of the best ways to do just that. 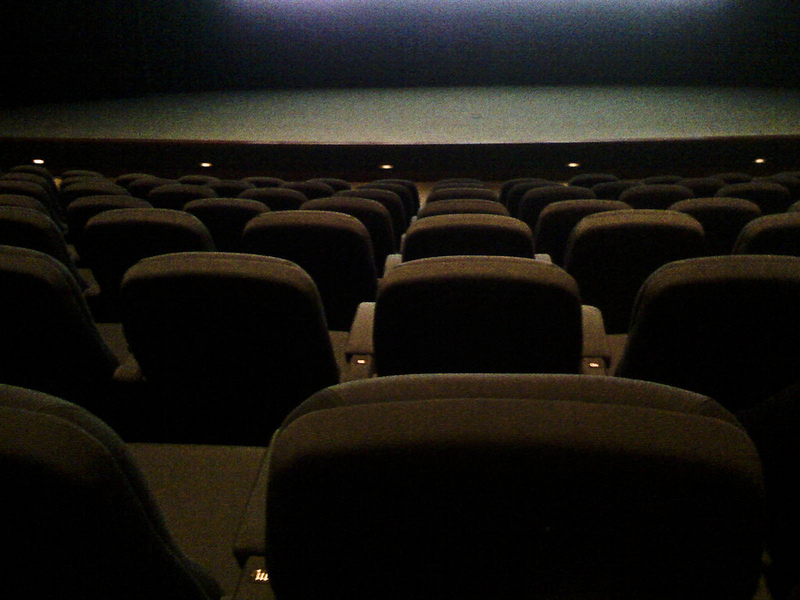 (PS: The above photo is from the private screening room at Warner Bros Studios. It was for a private Screening of Benjamin Button and is one of my favourite screening rooms ever – especially because, late at night, it’s amazing to wander the backlot and get caught up in the magic of it all). Oh, I really liked this post. I’ve never worked in the industry but have always loved movies, especially going to see them in a theatre. I love The Oscars and look forward to watching them every year, and one day I will host a big Oscars party just for fun. Both my husband and I have often commented that we’d both have liked to work in the film industry because we too adore films. I had wondered however whether working behind the scenes would take away some of my sense of wonderment and so it’s very interesting to read your story. Ultimately, I think that once you’ve been part of such a great creative process it must be very difficult to walk away because even with all its faults there is something just *so* satisfying in looking at the ‘end product’ and knowing that you were a part of it. I’ve always had a secret desire to be in the film business. I lived in LA for a while and came very close to applying for some jobs but I was afraid I wouldn’t make enough money to pay my rent so stayed in nursing. I still regret it. I’m sure it is very different behind the scenes but I wish I had given it a go. you’ve done much. . . been through much. . . and shine much. thank you for telling your tale. it helps.